Mississippi has a lot of unknown facts about it, from medical advancements such as the first human lung transplant in 1964, to the birthplace of the blues. The rich culture of Mississippi attracts many creatives, and it was the birth state of Oprah Winfrey. The longest river in the U.S., the Mississippi River runs through here of course, where it empties out into the Gulf of Mexico. If you’re thinking of moving here for the culture and rich outdoors life, then rest assured that you’ll have plenty of safe cities to choose from for residing in. 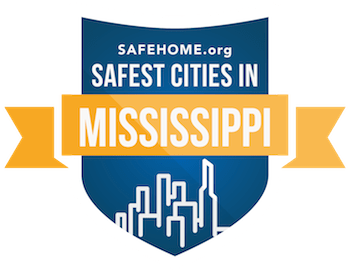 There are a lot of cities in Mississippi with smaller populations, so only a couple were eligible to rank nationally on our top 750 safest cities in the nation. Within the state, the top 25 safest cities range in safety scores from 92.41 to 49.36, with half having a rating over 70. Most of the cities have not had increases to their property and violent crime rates over the years, and a few experiencing significant drops in their crime rates. One of those cities experiencing a significant drop in its property crime rates is also the safest city in the state – Petal. Petal has a population of 10,790 and has a 41.6% drop in property crime rates. It is located towards the southern end of the state with a median income of $35,343 for families. The education here is very good, with level 6 rated schools. This attracts many families wanting the best for their kids, and contributes significantly to the low crime rates. Unlike other states, Mississippi’s safest cities are spread out all over rather than mostly concentrated outside of a major city. Brandon is located outside of the state capital Jackson to the east, with a safety rating of 90.3. Madison is north of the state capital, with a safety rating of 89.27. Then closer to the border with Tennessee is Oxford, with a safety rating of 86.92. If you don’t want to live near one of the biggest cities of the state, then you’ll have options from north to south all across Mississippi.